Shop for authentic Libya Flags. We offer indoor and outdoor Libya flags in durable nylon. Our outdoor flags are finished with a canvas heading, while indoor flags are finished with a lined pole hem and your choice of with or without fringe. We also offer indoor and outdoor Libya flag sets. 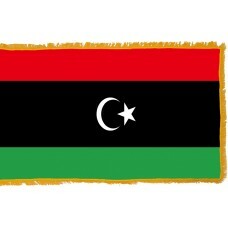 The Libyan flag features three horizontal bands in the colors of red, black, and green. The black band (center one) is double the width of the other two bands. In the center of the black band is a white crescent and white star. The red color represents the Fezzan region of the country, the black color represents the Cyrenaica region of the country, and the green color represents the Tripolitania region of the country. The white crescent and star represent Islam which is the national religion. 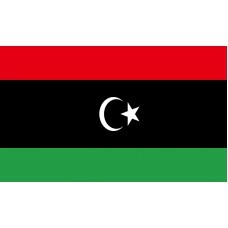 The Libyan flag was adopted on December 24th, 1951 and was used until 1969. It was re-adopted again in 2011. Libya is located in North Africa and shares borders with Egypt, Chad, Niger, Algeria, Tunisia, and the Mediterranean Sea. The capital of Libya is Tripoli. Libya used to be made up of three regions, which were, Fezzan, Cyrenaica, and Tripolitania. During the Italian-Turkish war in 1911-1912, Italy captured Tripolitania and Cyrenaica. They captured the cities in order to set up an Italian colony as the area used to be part of the Roman Empire. Following their victory, the Italians began to move to Libya to set up businesses and farms in order to supply food to Italy and they claimed and forcefully took some land in Cyrenaica. During these battles, over 70,000 people lost their lives. In 1942, during WWII, the British managed to capture Tripolitania and following the war the other regions were also captured and were then ruled by France and Britain. On December 24th, 1951, the United Nations declared Libya an independent country, The United Kingdom of Libya, and the three separated regions, were united and ruled by King Idris. Following the unity and Libya becoming an independent nation, it was faced with many problems, such as poverty, no doctors, pharmacists, or engineers as well as many other problems. On the morning of the September 1st, 1969, during a coup d'etat (a type of revolution), a group of officers took over the Libyan government. The chief of this group/army was Colonel Muammar Al-Gaddafi, who then proceeded to becoming President and ruled Libya from 1969-2011 until his death. During his ruling, the name of the country changed to "Great Socialist People's Libyan Arab Jamahiriya." The national flag was changed three times during his ruling (one of the flags was just plain green making it the only country in the world to have a plain flag) and he was a dictator who destroyed the country, banned free speech, and ruined a lot of the cultural heritage of the country. He supported the revolutions and terrorist activities, such as bombings. Libya is a country that is full of history and bloody, tragic wars. Despite the battles that have been fought here and the destabilization of the country by their leader, Libya still remains very beautiful with plenty of unique and historic sites to see. Tripoli is referred to as the "mermaid of the Mediterranean" due to its clear, turquoise ocean and the whitewashed buildings. That is just one of the many various attractions that Libya is home to.